Factors of 28 are 1, 2,4,7,14,28.
a) Multiples of 6 are 6,12,18,24,30,36,42,48,54,60,66,72……………. Multiples of 8 are 8,16,24,32,40,48,56,64,72,80……..
b) Multiples of 12 are 12, 24, 36, 48, 60, 72, 84, 96,108………. 4. Write all the numbers less than 100 which are common multiples of 3 and 4. 5. Which of the following numbers are co-prime? So 15 and 37 are co-prime. So these numbers are not co-prime number. So these numbers are not co prime numbers. Therefore the given numbers are co prime. 6. A number is divisible by both 5 and 12.By which other number will that number be always divisible? So these numbers are co prime and the number will also be divisible by their product, which is 60. 7. A number is divisible by 12.By what other numbers will that number be divisible? Since the number is divisible by 12,it will also be divisible by its factors . So 1,2,3,4 and 6 are numbers other than 12 by which this number is also divisible. a) If a number is divisible by 3, it must be divisible by 9.
b) If a number is divisible by 9, it must be divisible by 3.
c) A number is divisible by 18, if it is divisible by both 3 and 6.
d) If a number is divisible by 9 and 10 both, then it must be divisible by 90.
e) If two numbers are co –primes, at least one of them must be prime. f) All numbers which are divisible by 4 must also be divisible by 8.
g) All numbers which are divisible by 8 must also be divisible by 4.
h) If a number exactly divides two numbers separately, it must exactly divide their sum. i) If a number exactly divides the sum of two numbers, it must exactly divide the two numbers separately. 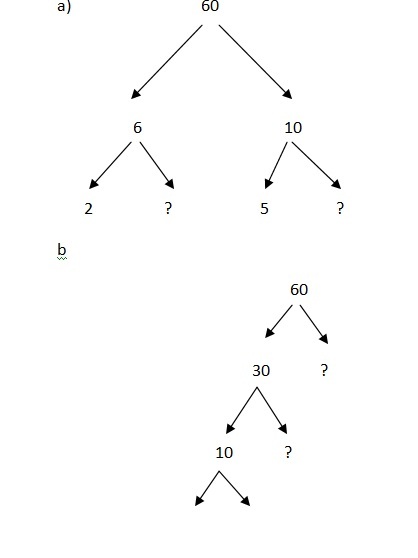 a) False, 6 is divisible by 3 but not divisible by 9.
c) False, 30 is divisible by both 3 and 6 but it is not divisible by 18.
e) False, 16 and 81 are co prime but both are composite numbers. i) False, 2 is divisible by 10 but cannot be divided by 7 and 3. 3. 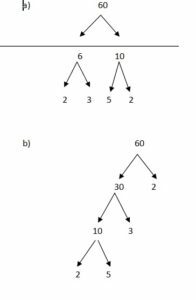 Which factors are not included in the prime factorization of a composite number? Ans. One and the number itself. 4. Write the greatest 4- digit number and express it in terms of its prime factors. Ans. 9999 is the greatest 4-digit number. Ans. 10000 is the smallest 5 digit number. 6. Find all the prime factors of 1729 and arrange them in ascending order. Now state the relation, if any; between two consecutive prime factors. The difference of two consecutive prime numbers is 6. 7. The product of three consecutive numbers is always divisible by 6.Verify this statement with the help of some examples. Ans. i) 2 x 3 x 4 = 24 is divisible by 6.
ii) 5 x 6 x 7 = 210 is divisible by 6. 8. The sum of two consecutive odd numbers is divisible by 4.Verify this statement with the help of some examples. Ans. 3 +5 =8 which is divisible by 4. 19 + 21 = 40 which is divisible by 4. 9. 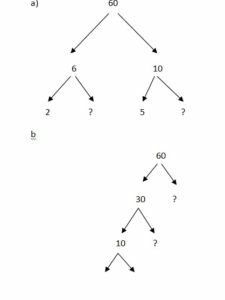 In which of the following expressions, prime factorization has been done? a) Since 4 is composite, prime factorization has not been done. b) Since all factors are prime, prime factorization has been done. c) Since all factors are prime, prime factorization has been done. 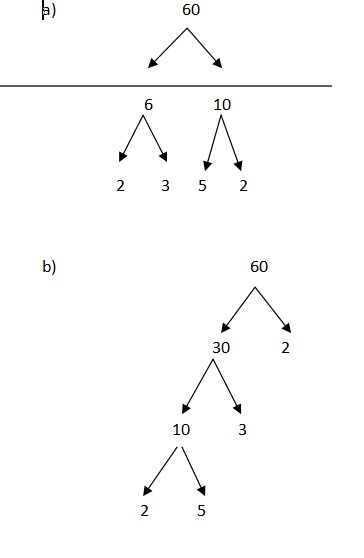 d) Since 9 is composite, prime factorization has not been done. So 5 and 9 are co – prime numbers. Since the last digit of 25110 is 0,it is divisible by 5. Sum of the digits = 2 + 5 + 1 + 1 + 0 = 9, which is divisible by 9. So 25110 is divisible by 9. Since 25110 is divisible by both 5 and 9, 25110 is divisible by 45 also. 11. 18 is divisible by both 2 and 3.It is also divisible by 2 x 3 =6.Similarly, a number is divisible by both 4 and 6.Can we say that the number must also be divisible by 4 x 6 =24? If not, give an example to justify your answer. Ans. No, Number 12 is divisible by both 4 and 6. But 12 is not divisible by 24.